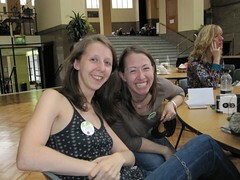 You remember my slightly crazy agreement to join a team to walk 20miles. 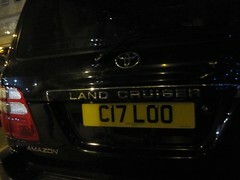 In London. At night. Without training. And that bacon sarnies don’t have a strong enough pull for me. Well, one of the reasons I wanted to make sure I had no lasting injuries was because I had been training with Anna for a 10k run since May. The day, as usual, rolled around much sooner than I anticipated. After getting back the use of my left leg again on the Tuesday, Anna & I thought we better get a run in before the big day – a 10k race for Cancer Research at Hampton Court Palace, which took place this morning. We did a respectable 4 miles, though my legs were sore and tired at the end. I couldn’t manage another 2 miles. I was hoping it was residual fatigue from the walk. I’m happy to report it was, and having rested the rest of the week, we were good to go today. Anna had only 2 hours sleep, and despite having had no rest, we ran a great run. We started out with Kirsty at the start. 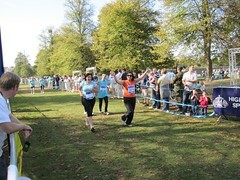 Thanks to James her fiance, I have a load of great pics of us running. 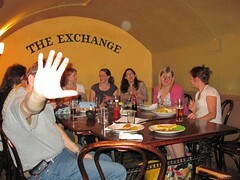 I seem to have a thing with throwing my arms in the air when being photographed, it must be the adrenalin! Monkey flight response or something like that. Here we are all fresh faced and enthusiastic. Of course we used the portaloos like they were going out of fashion. Nerves and small bladders and all. We saw Tina who volunteers alot of her personal time to the Cancer Research events, arriving with the other volunteers at 630am to ensure that everything goes smoothly for us runners. A big shout out and Thank you to Tina and all the volunteers who cheered us on, gave us water, and generally made sure we got to the end in one piece. We headed over to the start line, and ran out with our 60min+ group. We passed the clock at 15min13s and went on our way. Both Anna and I figured that we should be able to finish in under 1hr 20mins. We weren’t sure, but we were hopeful. 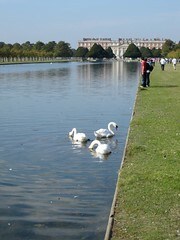 The grounds were absolutely stunning, and we had fun imagining what it must be like to have Hampton Court as your home, and Bushy Park as your own personal hunting grounds. Wild. 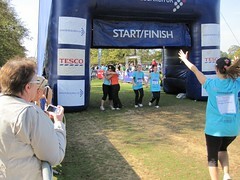 At about the 1km mark we spotted James and his cameras, and struck a pose. Approaching- automatic arm raise! And on our way to the 2km mark. Totally gorgeous. And the smell! Oh the air was so clean and fresh. Sigh. 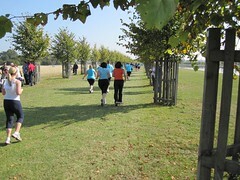 Anyways, we continued on, passing the golf course, and out the grounds to run along the Thames in the shade. Which was so lovely. As you can see, it was an incredibly sunny and clear day. Thankfully not too hot. 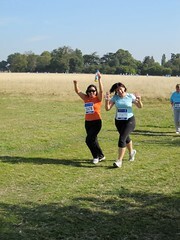 We passed the 5km without difficulty – and had some water and kept on running. Running with Anna was great – I had encouragement when I was a little breathless and slowing, and we kept pace for each other slowing when we had stitches (which we took turns doing) and speeding up when we hit a good stride. When we hit the 5km mark, I knew we’d finish strong. We both felt good and had a good stride going. 6km came and went. We passed 7km and I whooped, then 8km, then 9km. I was so happy to see the 9km I think I might have startled fellow runners with my shriek! It was such a fun run, that when we hit the gates back into the grounds, we were really on a high. I just was so happy that we were in good form, running strong, and with 500m to go we agreed that we would speed up when we saw the finish line and finish strong. We saw David, who cheered us, and then James with the camera. There go the arms again. When we got close enough to the finish line, we started to pick up our pace, and then I saw the clock – it was at 1hr31m. I was elated – so happy I think the extra adrenalin helped me not notice that I could barely breathe any more! 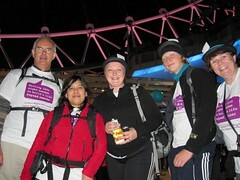 We had finished in an hour and 16minutes – 4 minutes under our goal time. We’re pretty chuffed – so chuffed that we had to hug. 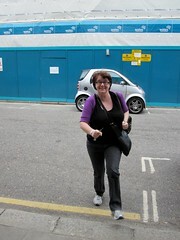 Then we had to keep walking to make sure our muscles didn’t seize up. We ran hard. We ran for over an hour. And we finished without stopping. Without walking. Without once feeling like we couldn’t do it. 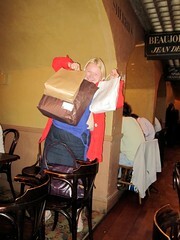 And for Anna, with only 2 hours sleep! So happy we finished under our goal time, and together and other than being out of breath, without any serious aches and pains. Here we are – Kirsty, Anna, Beth (? I hope that’s right!) and me. 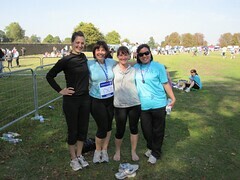 Sweaty and tired, but really happy with ourselves (Kirsty ran in 52 minutes!). 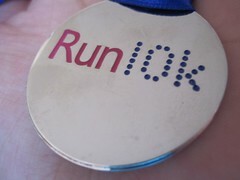 And my little medal. 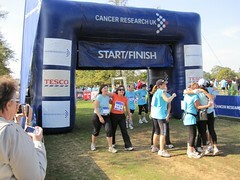 The next one we’re doing will be in December at Regent’s Park. We’re going to try to do that one in an hour. Bring it on! Masochism – an interesting concept. The dictionary defines it as ‘A taste for suffering’. Yes indeed, trying to walk 20 miles without training is masochistic. It is also rather stupid. Anyways, we’ll get to that later. Let’s talk about the walk. We started with Stephanie, Ned, Ali, her father in law Roy, Gerri and me. The starting area was just by Tower Bridge, and had a number of food stands. 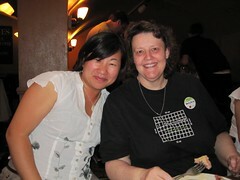 Gerri & I had a burger (really yummy) and some coffee while we were waiting for our 930pm start with the team. On these types of things, the thought of not being able to use the loo when you need to pee takes rather a big chunk of ‘things to think about while walking’. So before we started, we made sure we used the loos and then headed to the starting line. Here are Gerri, Stephanie, Ned & Roy in their starting pose. We set off, walking along the South bank. Along the river, under Southwark Bridge and past the pub in Mission Impossible, past the Tate Modern, then the Royal Festival hall. Really lovely walk. There were 8 stops spaced out along the way with refreshments and ‘entertainment’, and Stop 1 at 2.2 miles was a whizz round in the London Eye. Thank you London Eye! 🙂 It was full night when we got on, a clear night so the view was stellar. 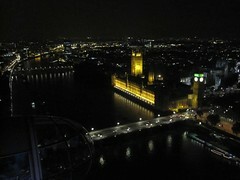 I took a shot of Westminster Palace (home to the Houses of Parliament) at the top of the wheel. At each stop was a drink and a loo. Because we didn’t know how the next loo would be, we used the facilities at Stop 1. The loo here was a swanky trailer affair, with cubicles and running water and a sink, pulled by a rather swanky Range Rover. No way you could mistake who belonged to what! It was easy to follow the big crowd of walkers, and we wandered over Westminster bridge, past the palace and the Abbey into Victoria. Our next stop was at 3.3 miles at the Channel 4 buildling where we had a mini tour inside the building. 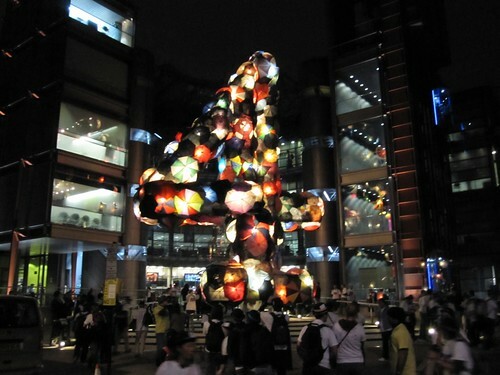 In front of the building is a cool 4 made out of recycled umbrellas. The next stop wasn’t for another 2.7 miles so I tried to use the loo here but gave up in the end as the queues were too long. Clearly many other peeps had the same thought. After Channel 4, we wandered up through Knightbridge, past the Lutheran Church off Walton Street, then down Brompton Road towards my old hood. That was quite nice, wandering around old haunts. We meandered our way past the Victoria & Albert Museum to Stop 3 at 6 miles, the Royal Geographic Society. The first thing we did when we got there? You bet. The stretch after Stop 3 was a tough one. My legs started to seize up, Ali’s heels started to bother her, and the walking sticks came out. We walked another 2.8 miles to Maggie’s Centre in Fulham where we were greeted with bodies lying on the pavement – some stretching some sleeping. We hit the loos first, then found a bench for a little sit down. The Centre was like an oasis within London – a huge plant filled courtyard with a building that had a courtyard within the courtyard. I wish my friend Angie had known about this place – I think she would have drawn much comfort from the centre. It had a zen vibe to it, and it was all light and open while still maintaining an intimate, comfortable feel. By this point I was limping a little and starting to feel my legs. My feet were fine, but my muscles definitely were having some words with me. We hit the 9 mile marker. 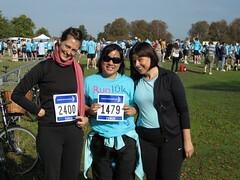 Then we hit Stop 5, Fulham Palace at 10 miles. By this time it was about 330 am. Fulham Palace was a loo stop, a stop for oranges, a stop to massage my feet as they were starting to get sore. A stop for attending to blisters (Stephanie), for changing socks (Ali & Roy). I wasn’t doing so hot by this point. Leg muscles ratcheting up the scolding to a screaming fit. We walked a couple more miles and my muscles decided that they weren’t going to play ball anymore and I had to pull out. 😦 David very kindly came to pick me up along the Kings Road. I left Gerri Roy Ned & Stephanie still going strong but Ali was fading – she had become very quiet at Maggie’s and we were worried. She did a charity hike a few months ago and her feet simply went kaput, all the capillaries exploding. 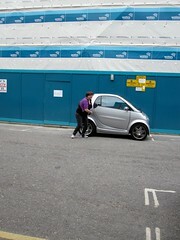 Ali had to pull out at the next stop (Battersea Power Station) with exploding feet. But Gerri, Stephanie (how could I forget you? I’m so sorry. I blame lack of sleep!) Ned & Roy kept on, and successfully passed the finish line around 830 this morning. They had a medal and a bacon sandwich waiting for them. At the finish, Gerri tweeted ‘I’ve been walking for about 41 years in ny life and I think I can say I never want to walk again”. LOL. I’m sure she’ll be fine – am sooo impressed with their feat. And feet. I think they did a brilliant job. Ali & I will give it another go next year (right Ali?) and B I’m taking you upon on your offer!! This time, I will train for it! Because it really is the most amazing feeling, being awake at 4 am with 2000 other people hanging out in these cool venues all for the same end goal. 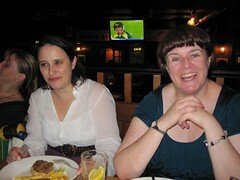 And a really nice way to spend 8 hours – walking and chatting, and later on, hobbling and grunting, with good friends. So what have I learned? A few things: 1) walking without training is stupid. 2) If there is a possibility that I won’t be able to use a loo for more than an hour, I will use every one I pass. and 3) Some people will do just about anything for a bacon sarnie. London Night Walk – eek! I think I must have been on drugs/jet lagged/asleep/all of the above when I said I would do this. 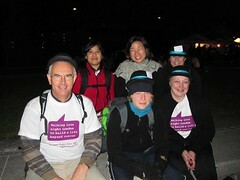 This meaning walk 20 miles at night through London for the London Night Hike with Stephanie, Ali and Gerri. It’s for Maggie’s Cancer Caring Centres, a place for anyone to go to for advice/help/support with cancer. It’s a good place doing good things for good people going through bad stuff. So I thought I’d be good too and take a little walk to support it. Well, the day has come around really really fast. Thoughts of fun have flown out the window like all those smart birds heading south for the winter. The one thought too stupid to leave and now rattling around alone in my mind is plain old fashioned fear. Like ‘oh my god what have I gotten myself into’. I’m sh*tting myself (giving my friends’ new baby a run for his nappies) because I’m not trained up and the idea of staying awake past 10pm and having to hike at the same time … well if you know me you know that I am absolutely crap at staying awake past 10pm. But it’s got to be done. As we are supposed to be fundraising as well as indulging in masochistic tendencies, we have a justgiving page here if you are moved to donate to this great resource for cancer patients and their loved ones. You see, Maggie’s Centre is a free resource, and they rely on crazies people like me who got hoodwinked volunteer to fundraise for them. Huge thanks and gratitude for everyone making a donation to the just giving site. Wish me luck, and maybe send along some good vibes, amphetamines and vaseline for good measure. We start walking tomorrow night at 930 and hopefully cross the finish line somewhere around 3am Saturday morning. Needless to say the shop will be closed on Saturday as I recuperate and try to convince my muscles to work with me again. eek indeed. Had a fabulous weekend! 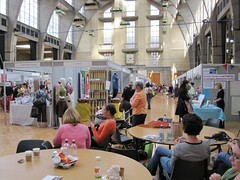 Friday i headed over to the first day of the iknit weekender at Lindley Hall. Had a class with Miriam Tegels who is just wonderful. 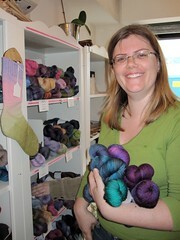 A great teacher, a FAST knitter, and a yoga instructor. Very cool. 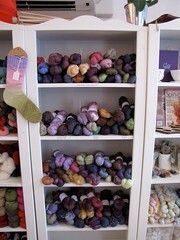 We learned how to knit & purl with minimal movement, to help us speed along with our knitting. Interspersed with tips and tricks on how to knit fast (118 stitches+ per minute fast) we did some amazing yoga stretches. Our class was full of friends which was such a treat! Triciaindahouse, Mulene, Bittersweetbaker, Sandykins, Sussex Yorkie, Natalie of the Yarn Yard, Jaq, Meljay, I know i’m missing a few people – forgive me it is a blur of faces! Wandered around the marketplace afterwards, and met up with ibecks, katetheyogi, and saw a number of Aurantium shawls (yay!!! go smskal-ers!). I only managed to take a photo of Kate’s though. 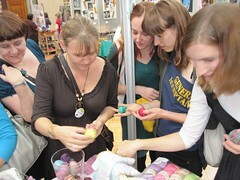 It was so lovely to see so many friends, near and far – Joy, Justine & Sally, Sandy, Jen, Emma, Lou, Gerri (scrumming to get their hands on mini-balls). 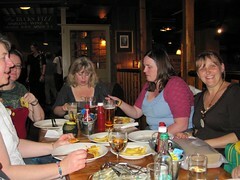 We headed to a local pub with Sandy, Lucy, Kerri, Hailey, Meljay, Pippa, Diane, Ingrid & her husband (Ingrid is organising Stick fast in Sweden in March), Mel, Justine, Jen, Judith, Bekky Joy Gerri & me. Following this I had a nice day at the shop on Saturday with Nora & Kerri, and got ready for the Old Maiden Aunt trunk show on Sunday. Which was an absolute blast. First off because Lilith is just a lovely lovely person and talented dyer. 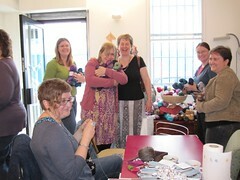 and secondly, because the knitters who came from far and wide were a great bunch. Remember that first photo? Here I’ll post it again to refresh your memory. At 1145 these four came running up to the shop door and finding it locked and thus a barrier between them and the yarn, they smooshed up against it hoping maybe to get a better view or Harry Potter the glass away. And to those who would deny that they smooshed up against the window… photo evidence shows otherwise! 😉 This was the yarn they were trying to get at. We took pity on the desperate purple people eaters.. and let them in. And of course the inevitable happened! 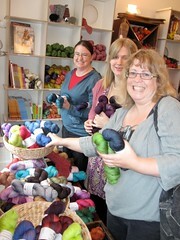 Mulene arrived, and saw that at 1minute to twelve the door was open and people had armfuls of yarn. What’s a girl to do but run for it? 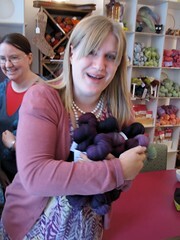 Thankfully there was plenty of purple to go around, and lots and lots of happy knitters. I got to meet Paula in person, some knitters down from Scotland, Marja came to join in the fun, and Ali brought peanut butter brownies (only one left over at the end of the day! sooo yummy thank you Ali!). 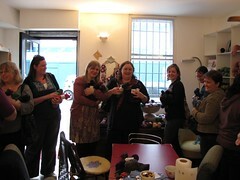 We spent the afternoon knitting and chatting and munching away. I caught the baby blanket bug (not for me mind, don’t get all excited please). Ali bought 8 skeins of Koigu for a baby blanket, and then I thought what a great idea, and took 8 skeins for to make a Big Bad Baby blanket. And then Tricia did the same. 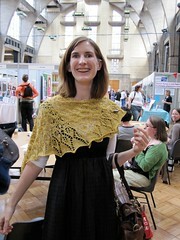 Good use of the Koigu – I may have to start a pink one too! Marjan (Yarnissima) came but spacecadet me completely forgot to take a photo. You see our last sock club sock was designed specially by Marjan. Goodness I love the sock and the design so much – she is just awesome in so many ways. She is off to Benediktbeuern next week to join Claudia (she of the Wollmeise, and the dyer of the yarn that pairs with Marjan’s pattern) at the fair. The dynamic duo! Not sure how i’m going to top this weekend! Thanks everyone for making it so fun and fantastic! The Knit Love Club ballot is open for another 5 days (and counting). For the last 5 days there is also a wee chance to win a year’s membership on Twitter – tweet why you love socks and tag it with hashtag #knitloveclub. To double your chances of making the club, make sure you’re in the ballot too. 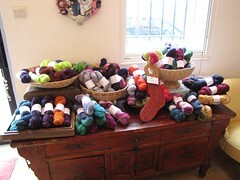 Then on Sunday we’ve got Old Maiden Aunt at the shop from 12 with her trunk show of amazing lovely yarns. Should be a fabulous weekend. Next year’s sock club open for ballot entries! Visit here for more details and to enter the ballot. Ballot closes on 15 September. 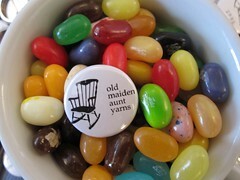 to say, awwwww, shucks! Thanks for all your inspiring and loving comments. I feel so loved up!